Getting into the Christmas spirit early this year is our pupil Rebecca Hanneman, who has joined the cast of CBeebies’ The Nutcracker! CBeebies staged their Christmas production at Sheffield Theatres’ Crucible this weekend, where it was filmed for broadcast in this year’s festive TV season. All our favourite people from CBeebies are appearing in this magical show like Justin Fletcher, Cat Sandion and Ben Faulks. Working to promote the show, our very own Rebecca Hanneman joined the CBeebies’ festival in Sheffield, where she joined the ‘toy makers’ was a doll who came to life (en pointe)! They performed a small ten minute show every two hours over the course of the weekend, meaning a total of 12 shows overall. It’s my first paid dance job and it was such an amazing experience. I met most of the production team who work with CBeebies and the presenters who are on telly! Well done Rebecca, we’re sure you made a pretty magical ballerina doll! See you at the Scholarships! We’ve had another very successful round of IDTA examinations and the results are in! Well done to everyone who took Grade 3 Tap and Intermediate Theatre Craft – you have maintained the school’s 100% pass rate and achieved a fabulous set of marks. A very special mention to Eve Wainwright, who has been nominated for her Intermediate Theatre Craft, and will take part in the IDTA Theatre Dance Awards in Manchester next February in the Performers’ Category! Eve recently took part in the scholarships a month ago for Grade 4 Modern Jazz and Grade 5 Theatre Craft. Eve performing in the Theatre Craft Grades category at IDTA Theatre Dance Awards 2016. Congratulations also to our younger members of staff, Lauren Newbould, Theresa Rycroft and Amy Smith who have achieved their Pre-Associate Level 2 Theatre Craft teaching qualifications. Best of luck to all taking part in examinations in the coming weeks! Easter term dates are as below – if you have any questions regarding class times please don’t hesitate to ask staff at class or contact us via our school Facebook page. As usual the Berry Babes have been performing with grace, hard work and beautiful smiles at in the Dearne Valley this weekend. Our Inters not only danced a lovely Trolley Song and Hairspray in the troupe section but took home the first prize gong for their fabulous performance of Comin’ Home. Well done to our younger pupils, particularly Hannah Braithwaite who earned a 2nd place for her Character dance, and Alycia Mayfield who took 1st place for her National. Our bendy wendies in the Gym section, Aliyah Xaba, Maisie Ganley & Megan Thorpe took 2nd, 3rd & 4th places respectively. Well done to Lilli Walker for winning her National section! We were very strong in many Modern sections this weekend, with Eva Cadet and Bridey Bonnet taking gold and bronze in their category and Lucy Holcroft and Kayla Barnes doing the exact same in their age group. Sunday saw a clean sweep of medals in two Modern sections; Junior Modern had Megan Bridger in first place, with Abigail Bridger and Niamh Thompson tied for second place, Isabel Adshead in third and Libby Rogers in fourth, while F Modern saw Bree Quinton, Alexandra O’Brien, Rebecca Hanneman and Charlotte Stones grab 1st-4th respectively. Our seniors also filled the podium for F Character with Rebecca in first place, Bree taking second and Alexandra receiving third place. The same goes for our ballerinas in E Ballet, as we saw Emily Gay, Liberty Shepherd and Eve Wainwright take gold, silver & bronze. Keep on doing what you’re doing kids! See you on Friday for more comp action! 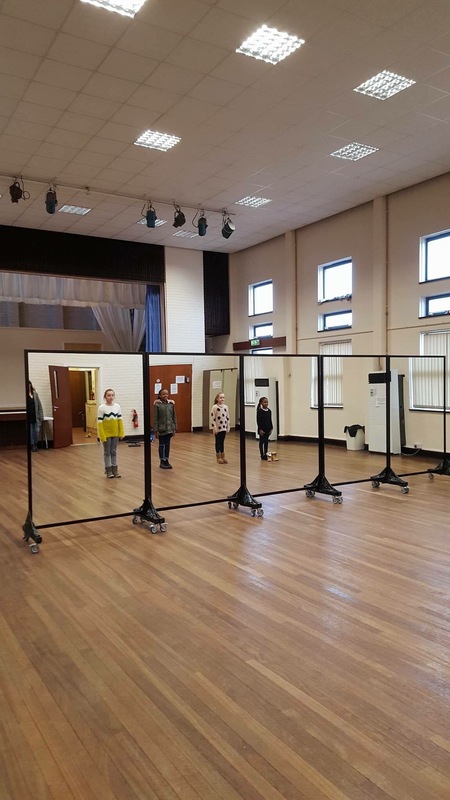 Thanks to your continued support and the mammoth efforts of our fabulous Fundraising Committee we have been able to purchase these mirrors for class! Mirrors help dancers perfect their technique – a nice enhancement for our lessons!